Good afternoon! A glorious one here in RBNY land and plenty to talk about. I've just about gotten over the total despair that took over my entire being a week ago. Hopefully, all Red Bulls fans have gotten over the disaster that was last Thursday's loss against San Jose (edit: a nice photo set has just been posted, courtesy of Chamber Images). That said, it's time to re-open those fresh wounds (ha, ha). Henry, we know, is returning from an injury - but could that possibly be any excuse for his appalling miss in the 88th minute - an unopposed header that he put over the bar? The gaffe marked the end of the Red Bulls season - and the end of Henry’s first season of play. I’m tempted to compare Henry’s adventures with those of David Beckham’s first year with the Galaxy: too many words, too many injuries - and not nearly enough good soccer. That's about as perfectly worded as it gets. 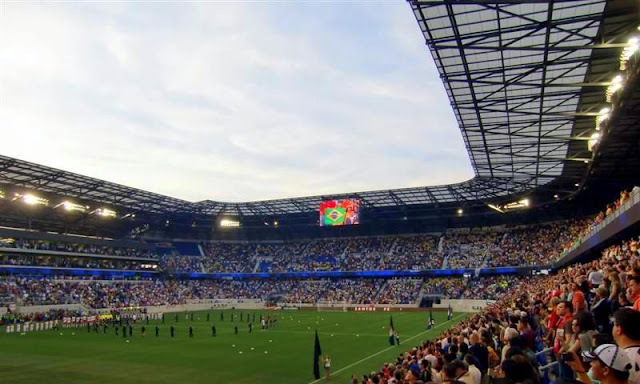 Here's another article on the disappointing end to the RBNY season, from Ridge Mahoney's MLS Confidential blog, that's also well worth the read. With several roster spots needing to be addressed, due to retirements, players out of contract, the 2010 Expansion Draft and the 2011 MLS Superdraft (where, apparently, RBNY has the 13th pick), changes are coming. Coach Backe expects to add three or four players from overseas, including the often mentioned Luke Rodgers and Jan Gunnar Solli, but might not replace the DP slot being vacated by the departure of Juan Pablo Angel. Even Thierry Henry has chimed in on the DP matter, stating that "it's not about stars" and that only offseason rest and cohesiveness next year will bring RBNY closer to an MLS Cup. I've never seen either player with my own eyes, but folks who I trust that have seen Rodgers are convinced he's a capable-if-volatile player who would be playing in the lower end of the English Premier League if he were 1) taller and 2) didn’t have legal baggage. If Mr. Lewis' sources are correct, RBNY might have a real gem, provided he stays out of jail (ha, ha). First, DC United's Andy Najar took home the 2010 MLS Rookie of The Year award. Really? There's no doubt that Najar is an exciting player but no 2010 rookie had an impact like RBNY's Tim Ream. Straight out of the college game, Ream played every minute of every MLS regular season game for RBNY. He was a pillar at center back, was one of the reasons for the Red Bulls turn-around this year and even managed a goal. I mean, really, WTF??? Then, 2010 MLS Coach of The Year went to Dallas' Schellas Hyndman. Let's see: Mr. Backe adopts a RBNY team with five whole wins last years, 21 points in total, and takes it to a regular season Eastern Conference first place finish, with 15 wins and 51 points in total. I mean, WTF??? Last, San Jose's Bobby Convey took 2010 MLS Comeback Player of The Year. Convey was a regular in the Earthquakes line-up last season while future RBNY right back Chris Albright worked to rehab a potentially career-threatening knee injury. Signed in January, Albright played his first game in May, quickly won the starting right back spot and became a key player for RBNY. Albright had a massive impact on this team, with his stellar play, and might have been the MLS steal of the year. Now, the only thing Bobby Convey came back from was sucking all of last year, so I'll ask again, WTF??? 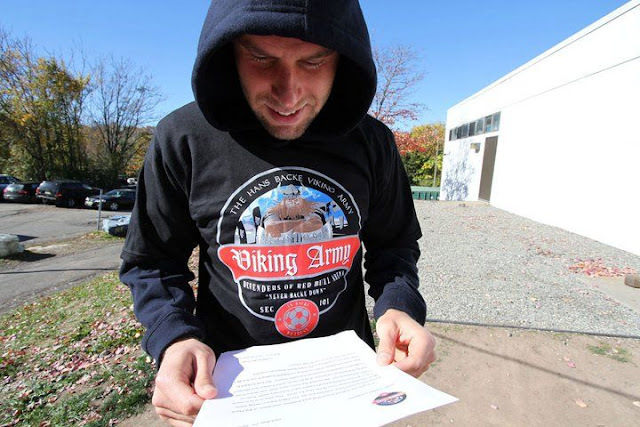 Then again, and at the very least, Seth Stammler did get the 2010 MLS Humanitarian of The Year award and, most importantly, Joel Lindpere got the MVP Thor of The Year award from the Hans Backe Viking Army. Speaking of Mr. Lindpere, what a masterstroke of a signing he turned out to be. Let's hope Jan Gunnar Solli is as good, if not better. Finally, Tim "The Red Menace" Hall has a great homage, to Juan Pablo Angel and Mike Petke, in this week's First Touch. Download it and read ASAP(scroll down to page 18), as it's way excellent. Are the playoffs broken? Well, the two teams that will play for the Eastern Conference Championship this weekend are actually from the Western Conference. That might might be indicative of something NOT being right. Check out this interesting article with a proposed fix. The Re-Entry Draft is quickly approaching. WTF is that??? Well, it's something that the MLS Players Union was able to wrangle as a concession from MLS owners. It's a good thing really, and it's there so that what happened to Kevin Hartman and former RBNY midfielder Dave Van Den Bergh doesn't happen again to other out-of-contract MLS players. While Re-Entry Draft details have just been released, they're a bit hard to understand. I've got a few links to explanations, so choose your poison by clicking here or clicking here or clicking here or clicking here. Is Brazilian superstar Ronaldinho really coming to MLS? It certainly looks that way. It's just too bad that he's not coming to RBNY. In a way, that's all for now. Viper Out!